Hi Jon and many thanks for this very timely post about podcasting. Just this week I launched my first ever podcast series – just wish I had previously seen the excellent webinar you provided access to in this post. Anyway I’ll learn by my mistakes and will definitely be implementing your suggestions in my next lot of episodes. I’m planning on just one episode a week with an average length of 15-20 minutes and my podcasts are aimed at giving simple and easy to use tips to internet marketing beginners. Congrats on launching your podcast! Podcasting is very much a process of getting started, learning, and growing as a podcaster, so it’s always better to have launched than waited. Good luck and stay tuned because Jerod Morris and I will be hosting more webinars for podcasters. Christian with the most active podcasts?! That blows my mind. Is that because pastors publish their sermons? That blows my mind too, but maybe there is some correlation between the popularity of Christian Rock and Christian podcasting? It’s really “religion,” not only “Christian.” But yes, a lot of churches publish sermons as podcasts. Wow, that’s some good growth. Let’s hope it continues. 60K active podcast now that’s amazing. I appreciate what you and Jerod do in the Showrunner podcast course. I may not have started my podcast without your guidance and the great community of aspiring podcasters. Keep up the funk. Yes, it is huge growth and I think we are just getting started! Podcasts can be a great way to build up your blog traffic or pitch yourself to potential clients if you’re a freelancer. It’s truly astounding how much it has grown over the last decade. Hopefully, it continues to grow! I agree that podcasting is a great way to gain website visitors. Having a podcast can definitely add to your authority within your market and hence help you land clients! 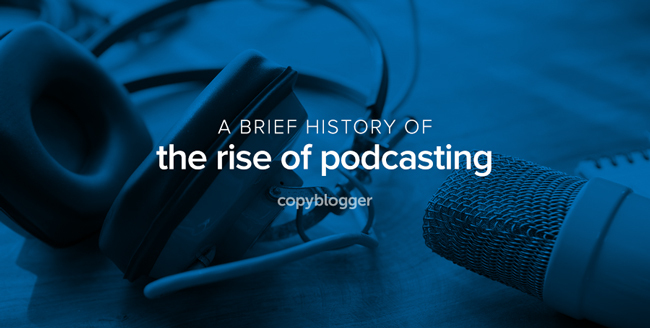 Here’s to more astounding growth for podcasting! Whats next for the average podcaster? I imagine the quality of the content is going to have to get even better in order to stand out among the crowd. Already I have noticed production values and good story telling abilities of the hosts have improved over the last few years. I feel that NPR and other podcast networks entering the ring have raised the bar. I am excited to see what the future holds for podcasting. The technology for distribution is bound to grow in the next few years. The production quality is definitely on the rise and important, but it will never be more important than quality content made to help your audience. You have to reach a minimum level of audio quality and technology is making it easier for all of us to do that. I’m excited to see podcasting grow ever further! John — really well written, and astonishing to see the growth of podcasting actually recorded on paper. Knew about it, but had no idea it had grown six-fold since 2008. Still have yet to find a podcast to listen to regularly. Which are your favorites? Any recommendations? Ted, I agree that seeing it on paper makes it a lot clearer. As for Serial, you are not the only listener who discovered podcasting with that show — successes like these will push the growth of our medium even further. As for podcast recommendations, I would suggest starting with Rainmaker.FM which has a ton of great shows covering many topics of digital marketing. As for personal favourites right now, I am really digging Question of the Day with James Altucher and Stephen Dubner. Will certainly give those a try! Thanks, Jon! Start a video podcast and kill two birds with one stone! A video based podcast is awesome because you have both YouTube and iTunes as massive distribution channels. Like most things that grow massively, you get diminishing returns and less share-of-attention when you’re late to the party… Unless you do something unique, really understand your audience and meet a previously unmet need. Still lots of opportunities, just not like shooting fish in a barrel anymore. I agree it is definitely not like shooting fish in a barrel, and that would be boring anyways. That said, the opportunity to reach and make a connection with an audience is enormous. Obviously not for just any show, but definitely for those of us willing to do the work and create a remarkable podcast. Awesome infographic. Planning a start a video podcast very soon. Surely this infographic will help me to make the podcast a better one. Am working on my first ever podcast and was searching for useful tips and came across this infographic. Its really informative and the growth over the years is amazing.